Rab Microlight Summit Jacket. Worn as a warm midlayer or standalone outer for fast ascents in the likes of Chamonix, the Microlight Summit is a streamlined technical jacket for when weight is a concern but function is paramount. Constructed with cutting edge Pertex Quantum Infinity Weave ? fabric, the Microlight Summit Jacket eliminates the need for stitch through baffles, reducing weight and increasing weather resistance. 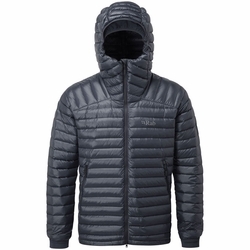 Filled with 750 fill power ethically-sourced hydrophobic down, it combines warmth with increased wind and weather resistance.